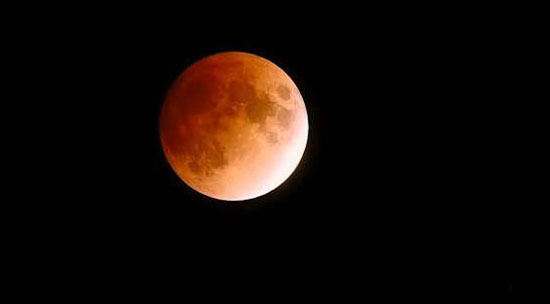 Wednesday sky night is extra ordinary as moon shines orange-red or Blood Moon! According to report, the October 7-8 lunar eclipse will begin at 6:25pm and will end at 7:24 pm and the partial eclipse will be at 8:34 p.m.
National Geographic states that this year is one of the rare years with four lunar eclipses. Today’s eclipse will be the second. Lunar eclipse happen when the sun, the moon and the Earth are aligned — just right for the Earth’s shadow to cover the moon. Blood Moon is created by the full moon’s passing into the earth’s shadow during a total lunar eclipse. In case you have bad weather in your place, below are the photos and videos shared by stargazers on social media sites Facebook and Twitter. Check out the Live Video Feed from NASA on this link.